Heading Real relief. Real fast. Directions Adults and children 3 years of age and older: apply to the affected area (one spray). Allow to remain in place for at least 15 seconds then spit out. Use every 2 hours or as directed by a doctor or dentist. Children under 12 years of age: should be supervised in the use of this product. Children under 3 years of age: consult a doctor or dentist. Store at room temperature. 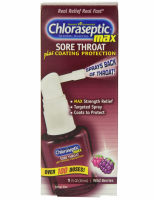 Uses Temporarily: Relieves sore throat pain, sore mouth, pain associated with canker sores, minor mouth irritation. 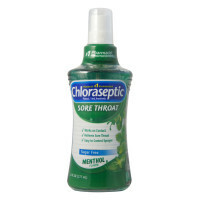 protect irritated areas in sore throat and sore mouth. 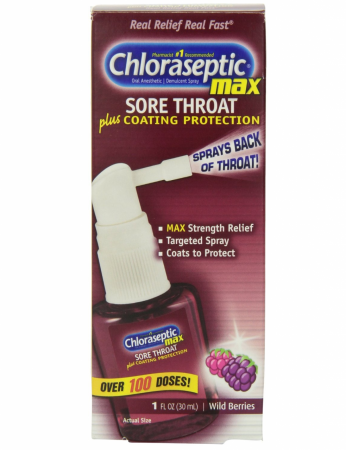 Targeted spray reaches back of throat. Over 100 doses. Warnings Sore throat warning: Severe or persistent sore throat or sore throat accompanied by high fever, headache, nausea and vomiting may be serious. Consult a doctor promptly. Do not use more than 2 days or give to children under 3 years of age unless directed by a doctor. 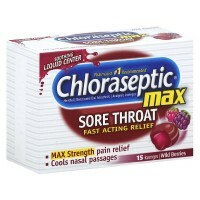 When using this product do not exceed recommended dosage. Stop use and ask a doctor or dentist if: sore mouth symptoms do not improve in 7 days. Irritation, pain or redness persists or worsens. Swelling, rash or fever develops. If pregnant or breast-feeding, ask a health care professional before use. Keep out of reach of children. In case of overdose, or accidental poisoning, get medical help or contact a Poison Control Center right away.